Telomeres are the end stretches of the DNA helix. As animals age their telomeres become progressively shorter,which is a natural part of the aging process. 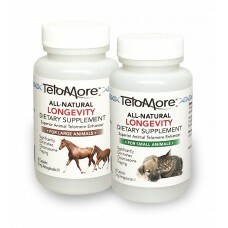 TeloMore simply helps slow down or reverse that process and improve cell longevity. RECOMMENDED USAGE DIRECTIONS: Give the animal 1 or 2 capsule daily, depending on weight (preferably before retiring or between meals), on an empty stomach. After each year take a 2 week to 1 month pause before resuming. Note: Resveratrol, Quercetin, Melatonin, Curcumin and Silymarin can possibly interfere with Astragaloside IV’s purported benefits, and they should not, therefore, be taken together with it. Consult your veterinarian to make sure that any medicines or other supplements are not contraindicated, counterproductive or negatively affected by TeloMore Astragaloside IV. 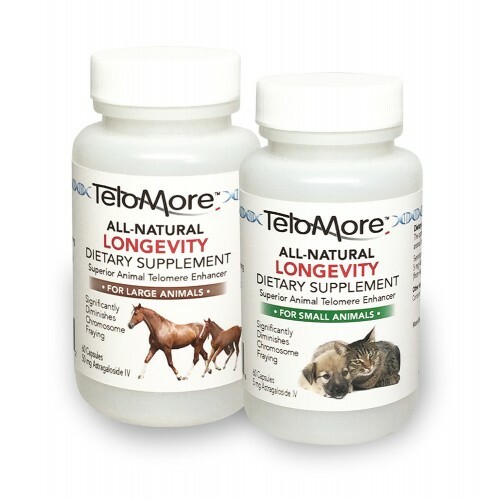 In order to test the effectiveness of TeloMore on your pet, your veterinarian can take a blood sample before you begin administration, then six months later, and have the telomere lengths compared. If desired the test can be repeated annually. A list of laboratories that run this test is available on request.